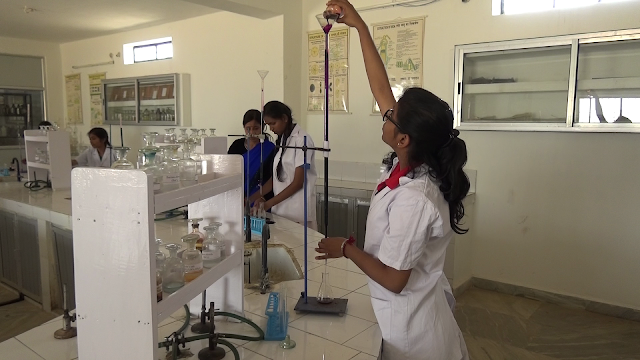 The avant-garde Chemistry Laboratory provides a platform for students to nurture the budding scientist within them. The laboratory is furnished with latest hi-tech interactive smart boards for a virtual real life learning experience.The Lab is provided with the state- of- the art devices like- Fume hood, Distillation unit, Electronic weighing machine, Concealed gas line and the safety devices such as Firefighting equipment, First- Aid Kit etc. The acids and other reactive chemicals are stored in separate cupboards as a further precautionary measure. The students are provided with separate workstations with individual burners and plug points. The apparatus includes the commonplace strikers, mortar and pestle, clay triangles, watch glasses, crucibles, crucible tongs, chemical spoon, stirring rods, filter funnels and a variety of stoppers.